Upland has been developing enterprise-level IT solutions for years. Backed by Austin Ventures, the company effectively helps clients plan, manage, and execute projects through their project management software. Its solutions have been implemented in more than 50 countries and are currently used by more than 12,000 enterprises around the world. More than 300,000 people actively use Upland software to complete their daily jobs. Tenrox is a workflow-driven project planning software that includes resource management and project tracking features. Tenrox is cloud-based and structured around visual data interfaces. Simple, effective designs help team members jump into the action without hesitation. It was built on the Microsoft technology stack to ensure reliability. As a Microsoft Gold Certified partner and Independent Software Vendor (ISV), Tenrox is as powerful as it is effective. Use the software to schedule user tasks, track workflows, and run reports to increase your productivity. It also provides a built-in integration system with all major customer relationship management (CRM) and accounting softwares’ for increased effeciency. One of the best features of the Tenrox project management software is the ability for users to implement modules independently. Some companies prefer to start with the financial planning abilities, tracking costs and billing. Others prefer to mainly use the project planning software features. This flexible solution allows clients to grow their solution to fit their need. Create the perfect software solution with Tenrox as needs arise. 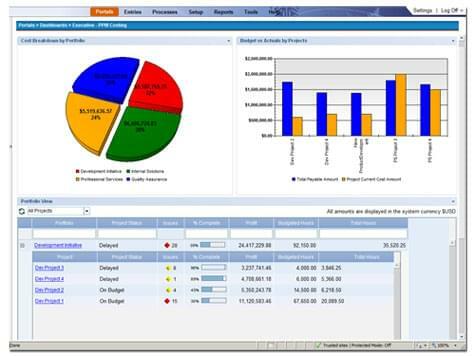 Find the best project management software options using our Project Management SmartAdvisor. Learn everything you need to know about Upland Tenrox. Our experts will reach out to you shortly.